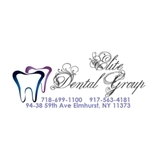 Elite Dental Group PC (Elmhurst) - Book Appointment Online! If you are looking for a highly trained and experienced dentist in Elmhurst you have come to the right place. At our practice, you will receive the highest quality dental treatment with the utmost attention to detail. Our dental office uses the newest state-of-the-art equipment and cutting edge technology and we also uphold the strictest sterilization techniques. We know that some patients may feel anxious about their visit to the dentist, which is why we make it our goal to make your visit with us as pain and anxiety free as possible. We treat all of our patients like family. key points to note about the office; - Staff is pleasant and bilingual. - Office looks like it gear towards kids and it is clean - X-rays was done efficiently and quick - The dental hygienist was awesome with cleaning my teeth. - Straight forward doctor, asked if I had any dental problems and provided information about my teeth, and basic information regarding my insurance. The office was busy at that time of day so wait time was average not too overwhelming, may about 35mins wait. Over all very pleasant experience.